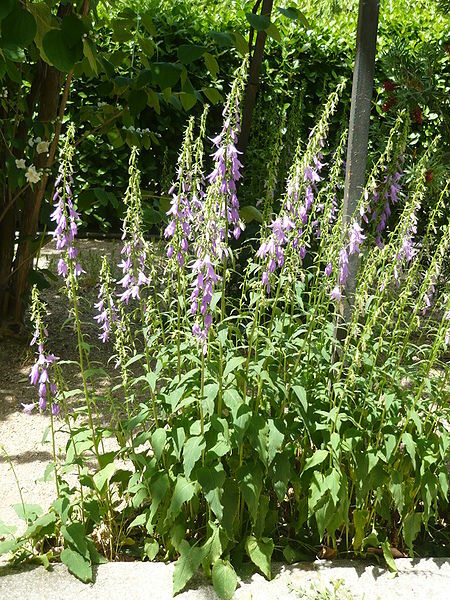 Campanula rapunculoides is a perennial herb 40 cm to 1 m tall, from a rhizome with numerous, fleshy roots, stem erect. Leaves alternate, lower leaves long-stalk, blade egg to heart-shaped, upper leaves increasingly narrower with shorter stalks, margin coarsely toothed, tip pointed, base rounded to lobed. Flowers blue, tubular, narrowly bell-shaped, 2-3 cm long, nodding, in an unbranched cluster at top of plant, blooms July-Aug.
Fruit dry, short, roughly hairy; seeds released through pores at base. Habitat: A roadside or lawn weed.